As those who read this blog know, I was late to the Mad Men party, having missed the first season during its initial run, but catching up in the run-up to Season Two sometime around the Twitter debacle and a marathon on AMC. Once I fell into the show, I fell hard. I really got my fandom tweaked when I bought a cartoonish/caricature t-shirt of Joan and linked to the amazing, kitschy artwork of “Dyna Moe” and then I went dressed as Don Draper for Halloween. Today there’s a new toy for the aspiring 60’s-era copywriter and slavering Mad Men fan: Mad Men Yourself. This is by no means a new or novel idea, but it’s well-executed and it definitely ties together my love and yearning for the show, a very specific visual kitsch and the propensity for folks to decorate their online social spaces with bits of pop culture accoutrements. I’m not the first to notice the trend, but I predict I’m hardly from the last person, either. For as good as the Mad Men Yourself experience is, I’m kind of miffed that not everyone can participate in AMC’s other cool Mad Men promotion of the moment, their online Casting Call. Seems you have to visit the retail location of their promotional partner, Banana Republic, to get a code to participate, which earns them the big, read FAIL stamp. Is my fealty to mentioning your programming, watching & blogging religiously and giving a shout out to your promotional partner not enough? Give me a call when you’re ready to notify me that I’ve won. Oh, and Season 3 of Mad Men premieres Sunday, August 16 @ 10pm. More shots of me AND Jenn as Don and Betty coming soon. These are courtesy of co-worker and commenter Mel. Late Update: Jenn & Seth as Betty & Don. I don’t watch SNL on a regular basis. I love me some Mad Men. So who’s disappointing me this week? It takes a lot to shock me when it comes to Hollywood business. But this is lunacy. I’ve confirmed that Lionsgate execs are calling Hollywood agencies looking for a showrunner to replace Matthew Weiner, the brilliant creator of Mad Men. The reason is that they think Weiner’s agents at CAA are asking for too much money for him. I hear CAA wants a multi-year deal that pays Weiner $10 million a year. (As opposed to what people tell me is the $2.5 million he should probably pocket…) Plus he wants control over promotion and advertising. Now that’s consistent with a big hit on pay cable and what Darren Star or David Chase made on HBO. But it’s way, way rich for a Lionsgate show on AMC, and execs are telling CAA it can’t pay that. “The ‘ask’ was insanity,” one insider tells me. “It’s preposterous. AMC is a basic cable network. The economics don’t support this. It’s why Lionsgate is throwing their arms up in the air. And, remember, they got a two-year pickup for the show with or without Matt Weiner.” So Lionsgate picked up the phone and began asking the tenpercenteries for a “general list” of possible showrunners, and about the availability of specific names (like Aaron Sorkin). The agents’ reactions were exactly like mine: are these suits NUTS? Sure, AMC doesn’t have the numbers now, but they’ve got all the pop culture buzz in the world and their numbers are improving. Please, don’t let Lionsgate pursue this folly any further. Negotiate with Weiner and make some more great TV. I think there are some really cool advertising opportunities/sponsorships (duh!) that AMC has yet to explore and that Weiner could really help with. I also have to believe that the accolades, the Twitter brouhaha and, oh yes, the quality of the show will garner more eyeballs in the future. Plus, would it kill AMC to run it at a time when the broadcast season isn’t siphoning viewers? Stop me if you’ve heard this one before, but I’m now head-over-heels in love with Mad Men. Actually, if you’ve read this blog at all in the past month, you’re probably sick to death of it/me. Still, I’ve got a few links to share to either fuel the fire or burn you out. Michael Kors (yes, I watch Project Runway too) is apparently such a big fan of Mad Men, it inspired his newest line. Washington Post article on the New York City of Mad Men. Limited Edition t-shirt with a silhouetted “Joan”. Found out about it on Monday, pre-order closed today @ Noon. Sorry. 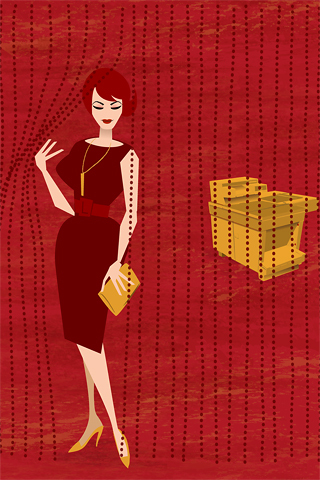 Mad Men-themed Illustration set. Brilliant and I’ve probably already linked it. Since I’ve only recently caught up, I’ll have to give these a try soon, but Kottke’s seal of approval carries a ton of weight.